A privately-funded search for the body of Moors Murders victim Keith Bennett has begun in the Pennine hills near Manchester. The 12-year-old vanished from his home in Longsight, Manchester, in 1964. 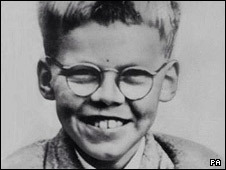 He was one of five children abducted and murdered by Ian Brady and Myra Hindley. Police abandoned the search for Keith's body last year, saying it would resume only if new information came to light. Donations of money from hundreds of people have funded the search. Keith's mother Winnie Johnson, 76, has not been able to hold a funeral for her son as his body has never been found. The BBC's North of England correspondent Danny Savage said the privately-funded search, carried out by volunteers from a Welsh search and rescue team, offered Mrs Johnson new hope that her son's grave might be located. "This is probably her last hope of locating her son's body," he said. 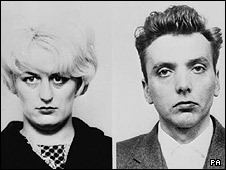 "With Myra Hindley already dead, she told me she wasn't going to be defeated by what Ian Brady did. "But finding Keith Bennett's body in this vast area will be difficult. "The police and advanced technology have been defeated for years but Keith Bennett's mother is clinging to the hope that this search will deliver." Keith was snatched as he walked to his grandmother's house in Longsight. He was the third of the Moors Murderers' five child victims. Pauline Reade, 16, disappeared on her way to a disco on 12 July 1963, and John Kilbride, 12, was snatched in November of that year. Lesley Ann Downey, 10, was lured away from a funfair on Boxing Day 1964 and Edward Evans, 17, was killed in October 1965. Brady and Hindley confessed in 1987 to killing Keith. Hindley died in jail in November 2002, aged 60. Brady has spent the past 25 years at the high-security Ashworth Hospital in Merseyside.